Blue skies and crystal clear warm waters sparkling in the sunshine, it’s not hard to see why couples choose this beautiful Country for their wedding. Greece offers you charming views and beautiful weather almost guaranteed. It’s a great choice for couples seeking a destination wedding. You can choose from holding your wedding on the beach, in a Greek ruin, stunning churches or gorgeous countryside or on one of its many beautiful islands. One of the most popular wedding locations in Greece is Santorini, famous for its bright white buildings with their cobalt blue roofs, cascading down the hillside overlooking the golden beaches of the Aegean Sea. Almost all professional wedding planners specialising in weddings in Greece will be able to offer you wedding packages to suit your budget. From helping you decide what type of wedding you are looking to have, a church or civil wedding conducted by a licenced celebrant or perhaps you’re looking to hold a traditional Greek wedding. 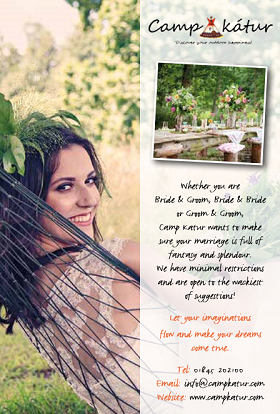 They can help, they know all the legalities and steps you need to take to organise your wedding in Greece. Rhodes makes the perfect wedding destination, with its lush green countryside, golden beaches, and archaeological sites scattered across this beautiful island. There are so many beautiful locations you can choose from. It’s well worth seeking help from a professional wedding planner who knows the area well, like Justine and Tracy from Unforgettable Rhodes Weddings, who can help organise everything for you and offer their extensive knowledge and advice on the area. They are worth their weight in gold, they will make sure everything is taken care of for you so you can turn up and enjoy your special day in the beautiful sunshine with your loved ones.